Candidates may apply on plain paper enclosing bio-data with all Educational Certificate Copies has to be send the following Email-id address. Required Details like Salary, Important dates, Selection Process, Email-id, Qualification are given below. Shree Siddheshwar Women’s College of Engineering, Solapur. Starting Date to apply for Professor/Assistant Professor Jobs: 18-03-2019. 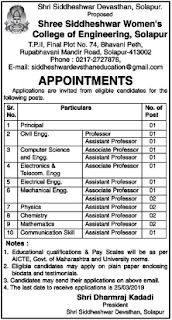 Ending Date to apply for Professor/Assistant Professor Jobs: 25-03-2019. Eligible Candidates may apply on plain paper enclosing bio-data with all Educational Certificate Copies has to be send the following Email-id address.